When you’re looking for an orthodontic specialist in San Jose, CA or the South Bay area, we at Mashouf Orthodontics strive to be your first choice. We’re proud to offer a number of high-quality orthodontic treatments, including many types of braces. We also pride ourselves on our welcoming, family-friendly environment that’s perfect for patients of all ages, including the youngest ones in the family. If you have a child who’s yet to see the orthodontist, we recommend you to bring him or her in to your trusted San Jose, CA children’s orthodontist to have an early screening. The American Association of Orthodontists recommends that a child’s first visit to the orthodontist be at the age of seven. The reason for this is that this the age when the first adult teeth- molars in the back and incisors in the front- usually emerge. This is the earliest opportunity we have to accurately judge the side-to-side and front-to-back relationships of the teeth. In contrast to the traditional approach of waiting for all the adult teeth to emerge before initiating orthodontic treatment during adolescence, we at Mashouf Orthodontics have developed an early treatment approach that provides highly efficient and effective orthodontic treatment for children between 7-10 years of age. Our unique approach applies the use of expanders and braces during a time when patients have both adult and baby teeth. Perhaps the greatest benefit of early treatment, among many, is that it prevents the need for removal of perfectly healthy adult teeth as part of the orthodontic process. Our minimally-invasive approach of not extracting teeth unless absolutely necessary is what differentiates us. Who Would Benefit from Early Treatment? Younger patients are more adaptive to orthodontic changes, allowing for enhanced stability of results. The teeth in younger patients require more guidance, but less pressure, which will minimize detrimental side effects. Treatment at an earlier age will have a reduced treatment time. Children will have minimal discomfort during treatments due to their teeth and bones’ lower resistance to movement. Younger children are also likely to be more enthusiastic about the orthodontic process. Early treatment will cost less compared to full orthodontic treatment at a later time. Contact Your San Jose, CA Children’s Orthodontist Today! Traditional orthodontics closer to the teenage years still has its place, and is preferable in certain cases, but for the reasons described above early treatment can be highly advantageous for many. If you have a child who you feel is need of early treatment or an early screening, feel free to give us a call at (408) 266-8820. Alternatively, you can fill out our online appointment request form. If you have any questions or comments, please don’t hesitate to contact us. We look forward to helping your child receive a healthy smile that will last a lifetime! At Mashouf Orthodontics, we're proud to provide expert orthodontic treatment to patients throughout the San Jose, CA area. We believe everyone deserves a healthy, beautiful smile that they truly feel proud of, and we take the time to work with patients on an individual level, customizing treatments to perfectly suit each patient's unique orthodontic needs. We treat patients of all ages at our office, including an age group for which braces are very common- teenagers. At this point, teenagers getting orthodontic treatment is so common that braces are almost something of a right of passage – but have you ever wondered why adolescence is the most common age for braces? It turns out, there are a few very good reasons for this. First of all, once a child reaches the teenage years, most or all of the permanent teeth have completely finished erupting. This means that changes made with orthodontic treatment act on the permanent teeth, providing a long-lasting improvement to the smile. Additionally, teenagers have high metabolisms and experience growth spurts – which we can take advantage of to speed up treatment and shorten overall treatment time. Traditional Metal Braces: These are what most people think of when they hear the word "braces." Made from high-grade stainless steel, they're a durable, reliable, and cost-effective treatment for almost any orthodontic condition. Damon Braces: Damon braces look and work similarly to traditional braces, but they use special "self ligating" brackets that don't require elastic ties, helping to speed up the treatment process and provide more comfort. These braces come in both metal and clear versions. Lingual Braces: While lingual braces are made from metal and work much the same as regular braces, they're the only form of orthodontic treatment that's truly "invisible" – because the brackets are mounted to the inside (tongue side) of the teeth! This makes them completely invisible from the outside, but they're also more expensive and difficult to adjust to than regular braces. Getting orthodontic treatment during the teenage years is a great way to set yourself up for a lifetime of healthy, beautiful smiles – and we would be thrilled to help you get there. If you're interested in learning more about orthodontic treatment for your child (or even for yourself), just give us a call at 408-266-8820, reach out to us at our contact page, or request a consultation online at our San Jose office. We can't wait to hear from you! Many people still believe the braces only suitable for kids and teenagers. That belief is quickly changing, as more and more adults are beginning treatment, and more discreet options are available! Adult braces have become increasingly common, and thanks to innovations in the orthodontic industry, there are many different types of adult treatments including discreet braces and Invisalign. Learn more about the benefits and adult orthodontic treatment options below! Tooth alignment constantly changes as gums and bone structure continue to develop and shift. Orthodontic treatment at later stages in life can dramatically improve your personal appearance and self-esteem as well as the health of your teeth and gums. Crooked teeth and a misaligned bite contribute to gum and bone loss, tooth decay, abnormal wear of the tooth enamel and surfaces, headaches, and jaw joint (TMJ/TMD) pain. At Mashouf Orthodontics, we offer a variety of treatments that are designed specifically for adults to improve appearance and oral health! New techniques and appliances greatly reduce discomfort levels, decrease the frequency of visits, and shorten treatment time. Treatment options include Damon braces, Invisalign clear aligners, lingual braces, and conventional braces. .
During the initial examination, we will determine and discuss the best possible treatment for your individual needs. During your consultation, we can outline the treatment plan, time of treatment expected and the approximate cost. At Mashouf Orthodontics, a large percentage of our patients are adults who agree that it’s never too late to improve your smile! Whether you’re interested in traditional braces or want to know more about Invisalign, you can visit our offices in San Jose, CA to learn more. Contact us today! Braces are still the most popular orthodontic treatment we offer – but they're far from the only option. Invisalign is an exciting alternative to braces that transforms your smile using a fundamentally different treatment method, providing an option that's discreet, convenient, and effective for orthodontic patients. At Mashouf Orthodontics, our San Jose orthodontists are experts in straightening teeth with Invisalign, and if you've been considering investing in a beautiful new smile, Invisalign may be the perfect option for you. Simply put, Invisalign is an alternative treatment to braces that uses clear, removable plastic aligners to straighten teeth instead of metal wires and brackets. The aligners are smooth to the touch and lay flat against the teeth, are almost invisible when worn, and can be popped in and out to eat, drink, brush, and floss. This makes Invisalign one of the most discreet and convenient orthodontic treatments on the market today – and it offers some unique advantages compared to braces. Eat What You Want: Invisalign aligners are removed to eat and drink, meaning you won't have to maintain the dietary restrictions that come with braces. Almost Invisible: Invisalign's clear, smooth aligners are almost impossible to see when worn, so no one will know you're straightening your teeth. Enhanced Comfort: Invisalign aligners are smooth to the touch, so they won't cause irritation and minor cuts in the mouth like metal braces often do. Oral Hygiene: Because you take the aligners out to brush and floss, oral hygiene is as easy as ever. There's no need to fuss with floss threaders or other devices. Just about anyone can receive treatment with Invisalign, and it's equally well-loved with patients of all kinds. Generally, however, we don't recommend Invisalign for early orthodontic treatment. 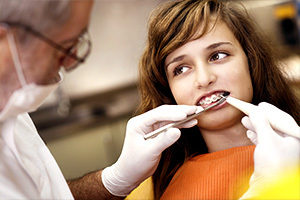 At that early of an age, it usually makes more sense to treat with braces. Busy adult professionals and socially conscious teenagers, however, both love Invisalign for the convenience it brings and its discreet appearance, meaning almost anyone at any age is a candidate for Invisalign. Compliance Indicators: Compliance indicators let parents, teens, and doctors know if the aligners are being worn long enough. Free Replacement Aligners: Every course of Invisalign Teen treatment comes with six replacement aligners, completely free of charge. This means you won't have to worry if any aligners get lost or broken. No! There may be some discomfort during the first few days of wearing a new set of aligners, but you shouldn’t feel any pain from it. Will I Have to Avoid Certain Foods During Treatment? One of the great things about Invisalign Teen is that unlike traditional braces, you won’t have to avoid any types of foods. Since you remove your aligners before eating, you can continue with your regular diet. We don’t recommend chewing gum with your aligners in as it can get stuck to the aligners. However, if you’d like to chew gum, you can remove your aligners beforehand. In most cases, an Invisalign treatment is comparable to metal braces in terms of cost. Invisalign is a versatile, convenient, and highly effective solution for anyone looking to straighten their teeth, and if you're interested in learning more, we would love to hear from you. Contact us today to find out more about how Invisalign can revolutionize your smile, or feel free to request a consultation online to get started. We look forward to helping you achieve the smile of your dreams through high-quality Invisalign treatment in San Jose!